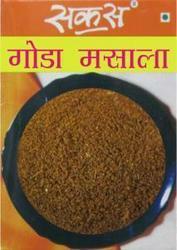 Kala / Goda Masala is one of the most commonly used masala in Maharashtrian recepies. It is reffered to as Kala (Black) masala since all the 17 ingredients used in it are dry roasted till it turns almost black. Also named as Goda(Sweet) masala since it does not contain chilly powder but provides only a tinge of spiciness. It is mostly used to cook vegetables and dal. A Spice-Mix that is must in every kitchen!! As a leading Manufacturer, Supplier & Exporter. Sakas Foods a home business established in 1986, started with 4 products namely whole wheat flour, besan(gram) flour, jowar (sorghum) flour, bajra (black millet) flour. Today we are one of the major leaders in procuring, manufacturing, wholesaling, retail distribution and sale of more than 100 different types of flours, rawa, spice powders, spice mix (masala), condiments and delicacies in pune. Our business philosophy is to offer healthy and nutritious food products using the best quality raw material at economical prices. We continously make efforts to provide our customers with freshly made food products adding a homely touch to it . We always ensure that the staff follows set principles of cleanliness and personal hygiene through the manufacturing and delivery process. Today with the love and support of our customers and staff, 'sakas', a sahasrabudhe family venture, has successfully completed 25 years in this business. Sakas food products are available in 500 retail stores and 17 franchises across pune.